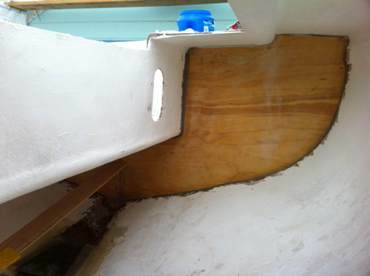 Do not let the date of construction deceive you, the boat is ready to leave and is in better shape then most new boats. 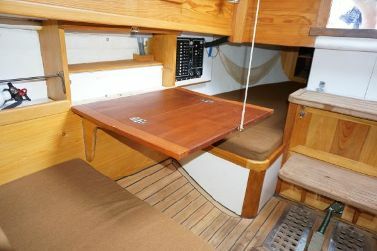 This boat is hull 16 of the Dolphin 24 class. These boats are known for their beautiful lines, comfortable layout below and ability over the years to bring silverware to trophy shelves with their good turn of speed. 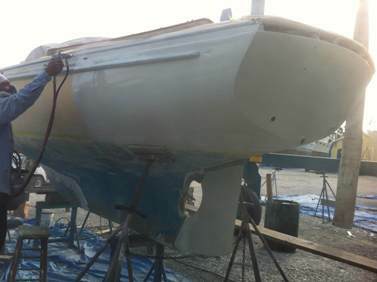 Do not let the date of construction deceive you, the boat is ready to leave and is in better shape then most new boats. This boat is hull 16 of the Dolphin 24 class. 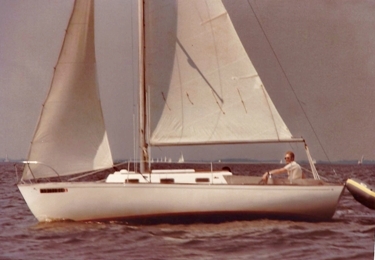 These boats are known for their beautiful lines, comfortable layout below and ability over the years to bring silverware to trophy shelves with their good turn of speed. 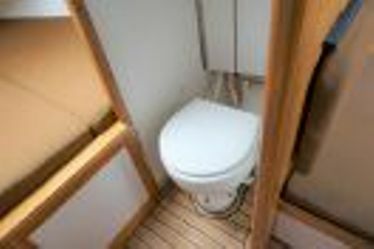 The boat is owned by a very talented shipwright who has restored her to a very high standard in every aspect. 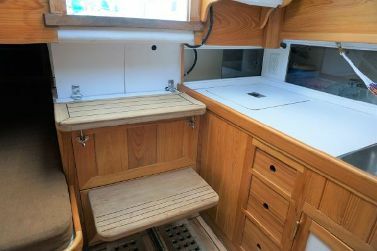 When on board "CONCH PEARL" feels like a much larger boat with all of the comforts and updated equipment for extended cruising off shore or the shallow water she has the ability to sail in with her centerboard. 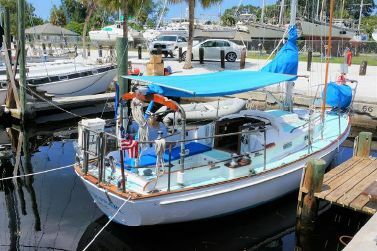 Please view the complete listing to appreciate what a great little yacht this is. 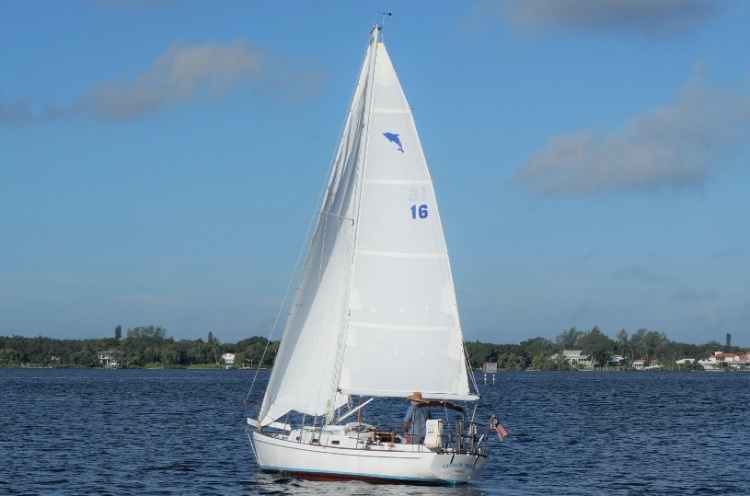 From 2013 to 2018 "CONCH PEARL" was refitted by an owner that was a boat builder with in depth knowledge of woodworking, fiberglass and rigging experience for his own use. In the process the following are some of the things improved from the original build.The deck was removed from the hull and all remains of the wood hull/deck joint were ground out. Bronze Centerboard - approx 130 lbs, new SS pivot pin, pennant routed to bronze winch, all new sheaves and hose. Four keelbolts , lags were removed and examined and found to be as new. 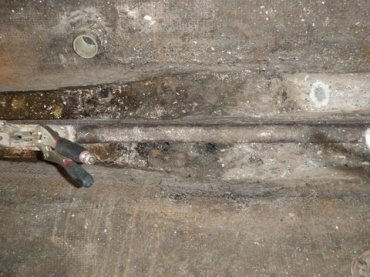 Being made of a superior alloy, they were reinstalled.The remaining 5 were undisturbed. 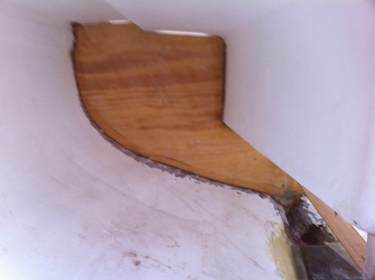 No movement at the keel was noted and the joint outside was reinforced with epoxy and biaxail. 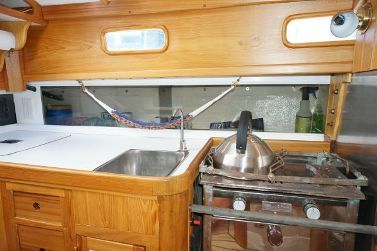 Equipment - Taylor 2 burner stove, 2- 12# lp bottles in a locker; Electric head, Self emptying 15 gal epoxy glass holding tank with deck pump out; 2 new 12 volt AGM 105 amp hour batteries New battery charger, True charge 20+Multi-Stage; 8 DC light fixtures; Bulkhead mounted compass; AC/DC electric panel with meters for monitoring. October 16, 2013. Robert Pitt checking in as the new owner of MELE, Marscot/O'Day hull #16. MELE's been waiting for her rescuer a while - but we know these ladies are patient! I am checking in as the new owner of Todd Croteau's Dolphin #16. 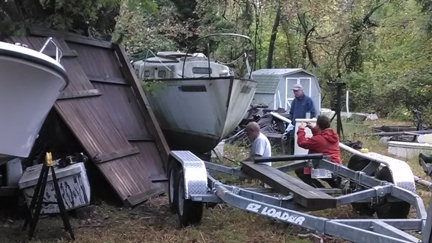 It is in need of a lot of work .We did a 3 day marathon trip from Tampa Bay area, Florida to Mayo, Maryland to get the boat loaded off the ground. Lots of jacking, rolling and wallering in the mud . The trailer info on your web site was more than helpful to prepare balance and poppet location prior to loading. This is one heavy boat. 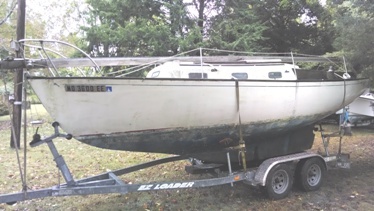 Will check in as work progresses, but for now it will just have to sit, as I finish my Abaco dingy to sell and a few other projects. 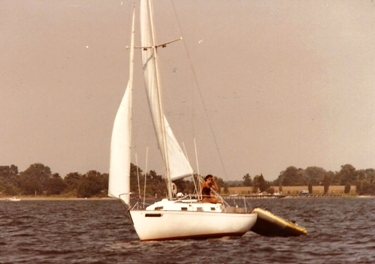 Know anyone interested in a just restored Winer Malone 14' sloop? A brief update on #16 ,soon to be renamed. All wood is being taken out . The only bit left at this time is the hull/deck clamp. 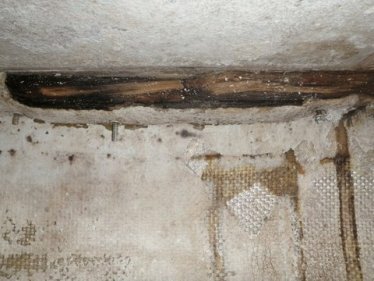 The plan is to remove it in approx 6' sections and replace it with 2-3 layers of 1708 cloth and epoxy. Hopefully this will maintain the shape. 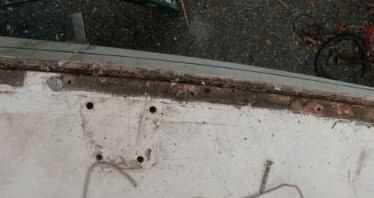 This boat seems to have had electrolysis issues, as the aluminium rudder post was rotted off at the waterline, heel fitting gone [alum also ?] and prop stern tube, brass heavily split on outboard end. Am planning on going with an O'Day / Yankee hybrid design. 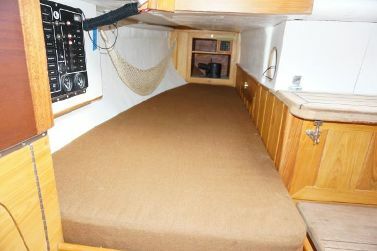 One quarter berth aft to starboard, galley to port with cockpit locker taking place of that quarter berth. Also to use the Yankee forwardd layout with the partially enclosed head bulkheads for lower shroud anchorages. 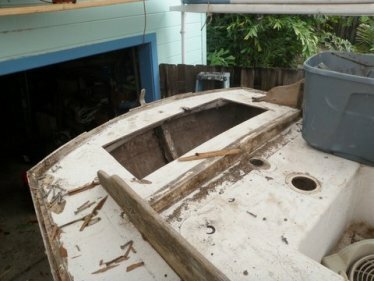 All the deck hardware has been removed except the cockpit coaming and they should be coming off this weekend. 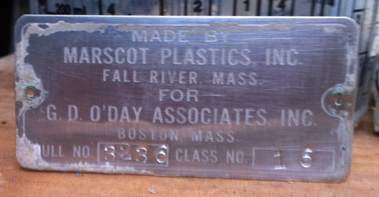 I have a great metal fabricator here who works from my mock ups and patterns, as I haven't aquired the skill of drawing. He is now building the rudder post out of stainless to the 1966 design, to which I will fasten a blade of Coosa board, a hi density foam/ glass composite board left over from a previous job. 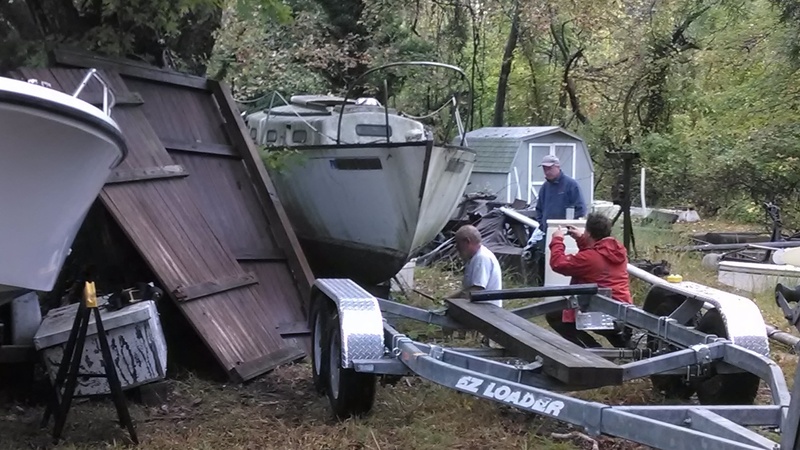 I have scrounged so much for this boat, that I wanted to name her DETRITUS, but I think that one was voted down . Progress has slowed down some what, as I rejoined the labor pool at the last true boatyard on the south edge of Tampa Bay, Snead Island Boatworks, who have been in operation since 1924 or there abouts, as a carpenter, rigger and glue boy. Hope to get all or most of the glass work do this winter, as grinding in the summer down here is the only thing I can think of that is worse than grinding glass in the winter. Photos should be sent soon. Click here to go to the Stories Section and see some of the photo gaps filled in from "hmmm..." to "we did it!" Ron, here are current pictures of #16. I am in the process of removing the shaft stern tube . Boy , what a horrid job . Sawzalls , sledges, drifts and bad language. It will have to rest till the next session. The rudder tube came out a little easier. It is no wonder that this boat was sans rudder when I got it. Aluminum, bronze and saltwater don't make a good combo. As you can see , there is little left inside. Structural work first , then the finish work. The hull/deck clamp (left/above) will have to come out in sections and be reglassed to maintain the shape. I will look into hiring a couple of hungry glassers to do this. The rudder post, heel fitting (above left) were made from my patterns by E&M Fabricators out by the airport. 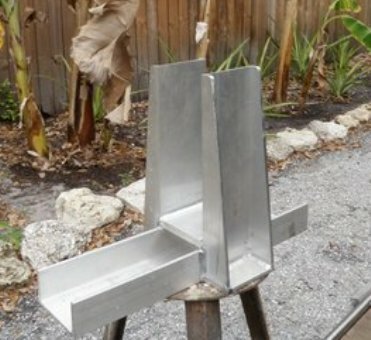 The piece on the post across the prop opening is to hold the shape till installed. 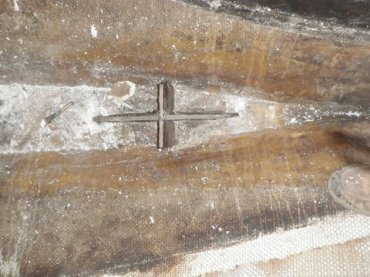 The mast tabernacle (above right) came about when I found the bend under one of the spreader bases. The tabernacle was built as a basic component to complete as the rigging end of things come together. I have run quite a few rebuild projects and the best way I know how to always be moving forward is to progress on several fronts. As one aspects stonewalls, shift focus to another area and sooner or later , you get to put all the pieces together. The tabernacle base will be tapered fore and aft, but will also include attachments and eyes for leading halyards aft and for the vang. What I usually do is cut the aluminum on my bandsaw, clamp it together and take it to the welding shop. There will be a pad under it for the cabin top crown and rake, which is not much. 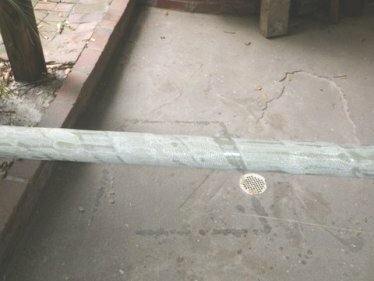 Regarding the mast, I found another mast in one of our local boatyards that was exact, but for 3 inches in length. 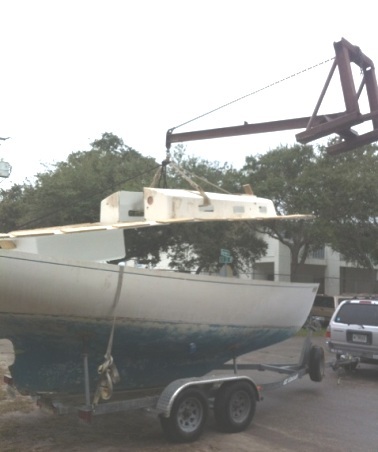 It came with one winch, standing rigging and a boom with internal reefs and outhaul - for $200. 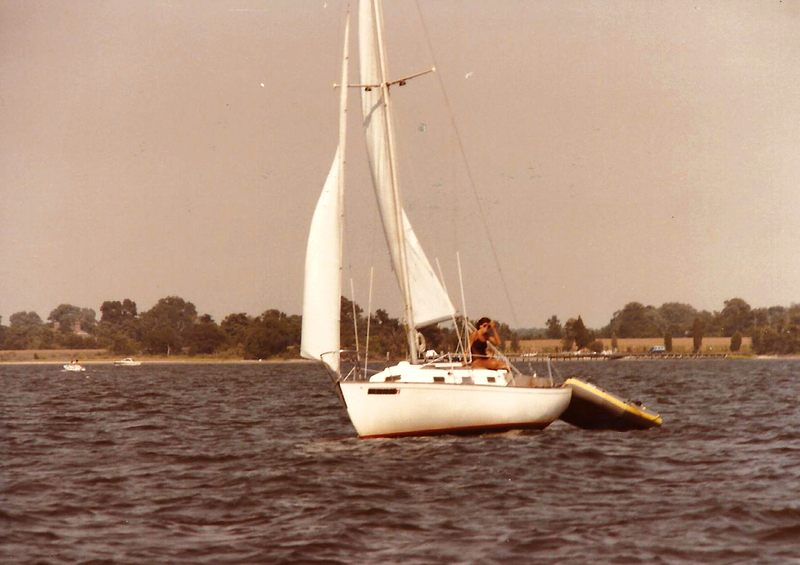 Also, it is about 50% deeper in section to use with a loose footed mainsail. December 27, 2013. Here an update from Bob. We got a lot of photos and when we get a chance we'll set up new, subject specific pages in the Technical Section. I have braved the underworld below the cabin sole. 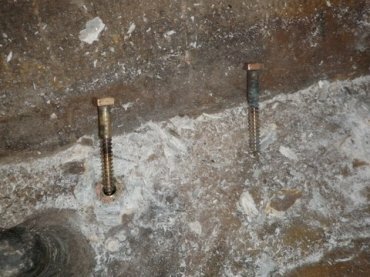 Lurking under mounds of mish mash are 9 keel bolts. 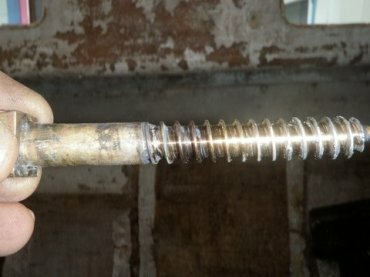 Well, not really bolts, but lags, 1/2' in diameter and 4" in length, with a square head. They readily came out after finding a square socket . The two that I have removed looked like the day they went in. The rest will come out a few at a time. 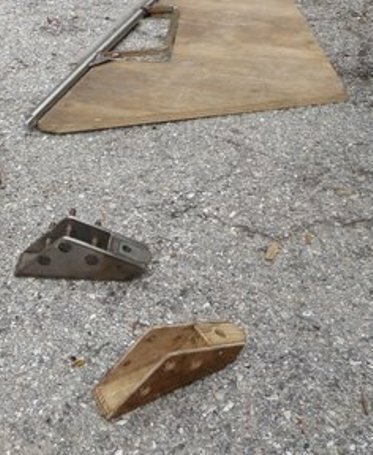 You can see the mast support pieces, an X made of fiberglass, with a lag right under it. That one will probably stay, if the others pass. Further aft, the stern tube had to come out. Split on the outboard end, and red from free electrons, it could not be trusted. What a terrible job. Laying on a piece of plywood on the engine beds and sawzalling and chistling for 3 hours is about all I can take. I am looking forward to going back to work! The rudder and tube are being built in another area of the shop. Glassing has begun on the blade and post, soon to be followed by tapering and fairing. The rudder tube (above right) I built out of a piece of CPVC tube, which is spiraled with glass tape and epoxy. The original was an aluminum tube glassed in to match the rudder built of the same. 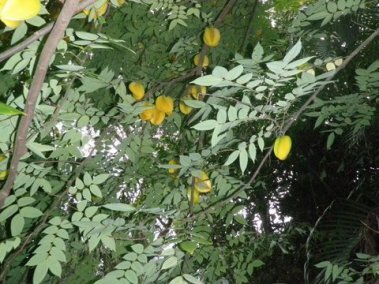 This last photo is of our Carimbola tree with one of its 2 or 3 crops a year. We sliced some up and put it on our Black Grouper Christmas dinner last night. Life is good down here in the semi tropics. May 4, 2014 - Bob is going to tell us how #16's hull/deck joint/clamp problems were resolved (minor edits). We have included his comments in the Technical Section page dealing with this general subject. Click here to go there. And, as Bob has sent in a number of pictures we have set up a special page covering this particular project. See link below. Got your interest? Click here to go to #16's new joint! As several are weighting in on this topic, I thought I would put in my 2 cents worth. 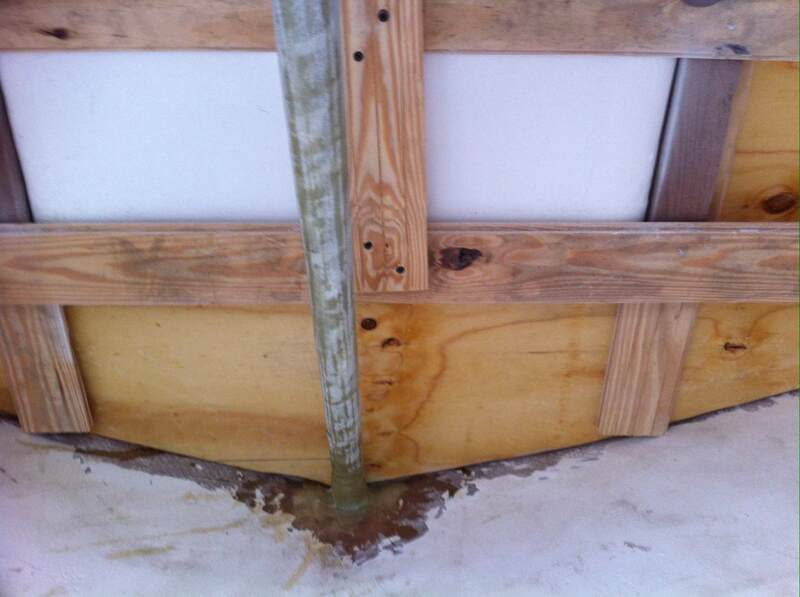 Conch Pearl , # 16 , has a completely new glass hull deck joint . When she was taken out to the local fish house to have some glass work done, the guy wanted to take the deck off to do a better job of it . After removing the old wood clamp, grinding the entire hull inside, the deck bottom and glassing over all unused holes (there were a lot), the deck was reinstalled with2 layers of 18/08 by 8" biaxial tape staggered 6" on deck, 2" on hull , 2" on deck, 6" on hull, to reduce grinding. Placing the deck back on the boat required screwing pieces of plywood along the deck edge to keep the deck from dropping into the hull . This was followed by one layer on the outside, and gelcoat. This took almost 5 gallons of gel. 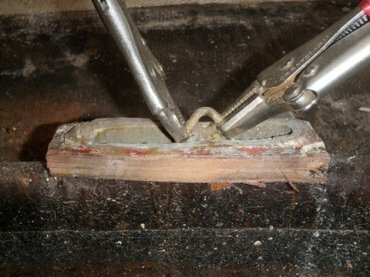 The only wood that was left in was the ply on the cockpit bottom, now Coosa board, and the cabin sole , with 3/4" ply. 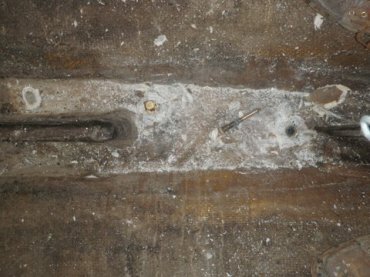 This left a very clean under deck where a.ll the bolt for toerails, stanchions, tracks and cleats to be bolted. This was done about 2 months ago. 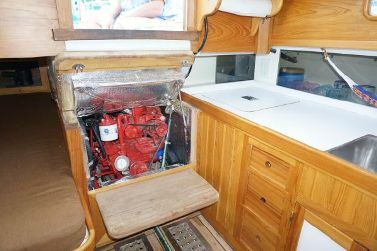 The project in hand is engine installation along with the attendant parts like beds , shaft, & stern tube, and exhaust. The list goes on and on. 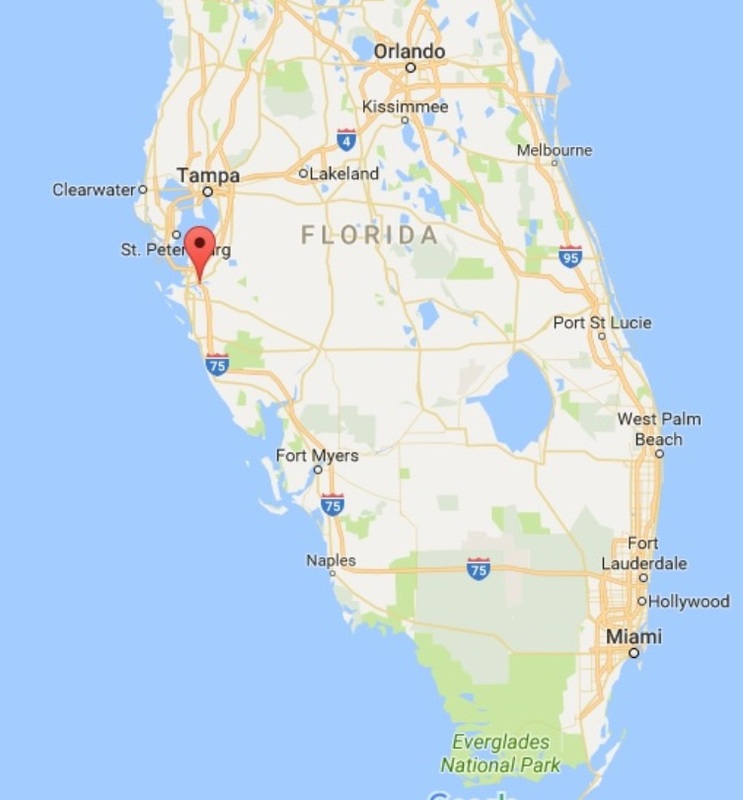 This is what is going on down here in Florida. I started working on the interior of Conch Pearl finally. The bulkhead at the aft end of the cockpit was installed in two pieces. Geometry rules and would not allow it otherwise. 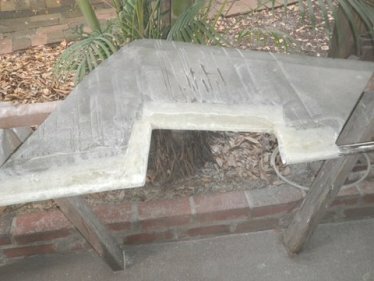 A form was built out of scrap lumber (photo 1) to support the pattern and locate the bulkhead for bonding. 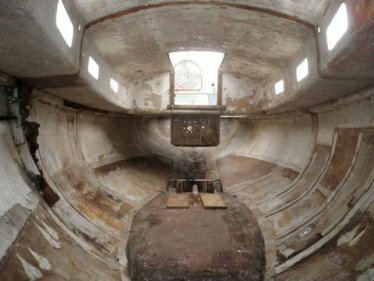 The photos below show the bulkhead looking aft - starboard and port side.There will be a quarter berth to starboard, and none to port, as there will be a cockpit locker on that side. 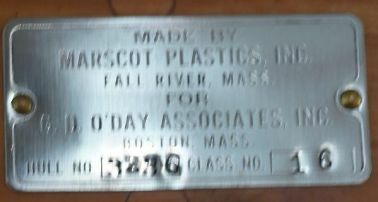 I have also included a shot of the plaque to add to your collection. 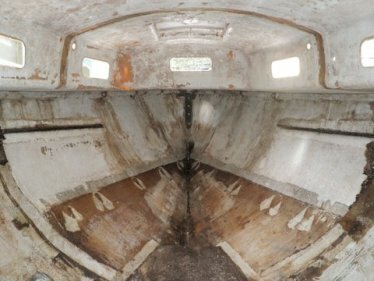 More shots of the quarter berth and engine space as work continues. I have 2 Westerbeke diesels for sale . A 7A-1 single with 242 hours complete with s.s. fuel tank and muffler. With manuals. $800.00. 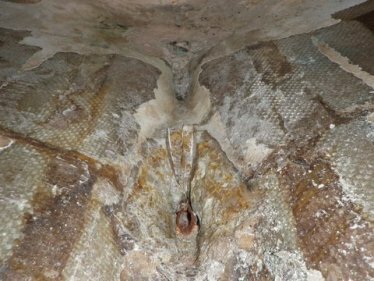 A 12-B of unknown age and hours, needs external parts reinstalled, all believed to be there. Also has hole in oil pan needs to be welded.$600.00 . Offers considered on one or both. Located in Bradenton, Fl south of Tampa Bay. December 26, 2015. We got the following greeting and update from Bob. It has been quite a while since I checked in. 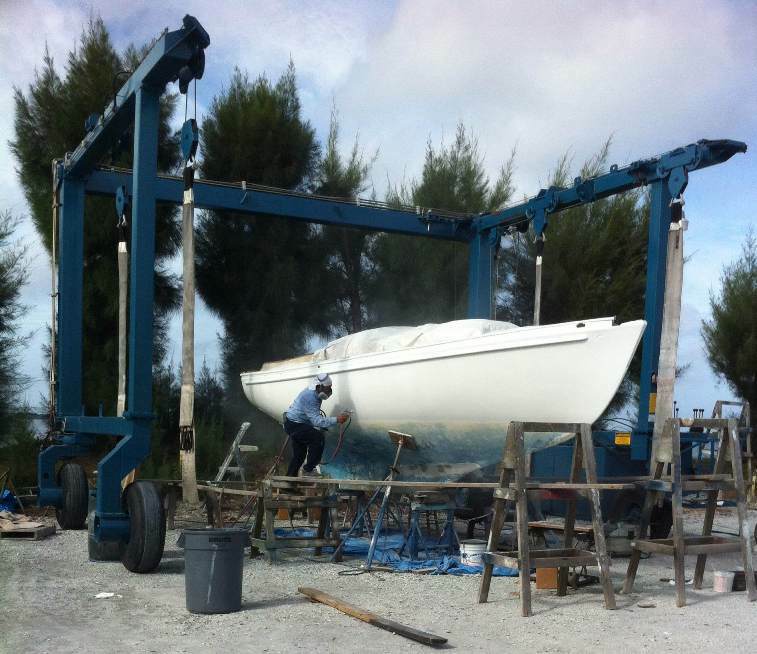 Conch Pearl, # 16, is in Snead Island Boatworks, where I work, getting prepped to paint. Hopefully the centerboard pin will come out tomorrow. Over the past year work has included new toe and rub rails with caps, cockpit coamings and new chainplates. The spreaders on the replacement mast were already at the improved design length, so I moved the chainplates inboard to match. Pictures to follow. January 2, 2016. The pictures have arrived! August 25, 2017. We got the following update from Bob. We are standing by for pictures, one of which gets to go, as promised, at the top of the page! Conch Pearl was launched today into the warm waters of the Manatee River . It has been about three and a half years in the works. More info to come shortly. Conch Pearl rode out Irma on her trailer in the driveway. Catagory 2 with about 110 mph winds. Lost a couple trees and limbs, but family and structures fine. 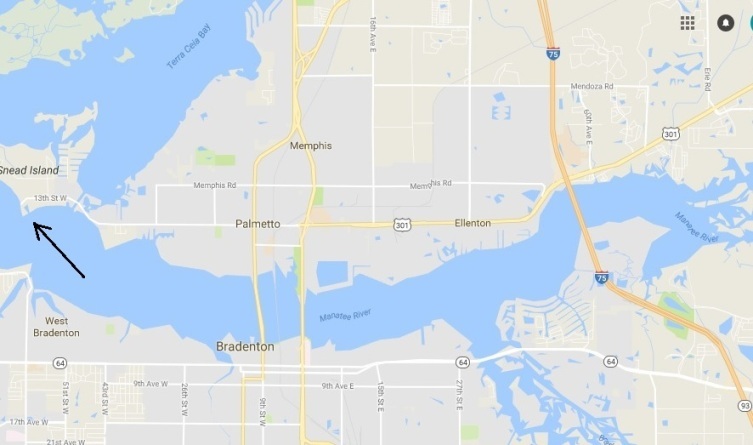 Irma's approach pulled a lot of water out of the Manatee River, and it might return with high tide today with a surge. Will walk down and look later. I think a Cat 4 or 5 might have been devastating to this area . We were very lucky with the track and wind speed reduction before impact. The big push to finish Conch Pearl is on. She is to be shown at the Florida Gulf Coast Small Craft Festival on the 21st . I will report soon after as I also am doing an article in Southwinds Magazine. They ran an article a few years ago, so this is to wrap that up . 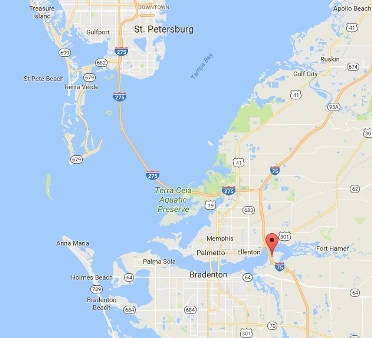 Anyone in the Sarasota, Florida area April 21, come to the Sarasota Sailing Squadron (http://sarasotasailingsquadron.org), near Mote Marine. April 20, 2018. 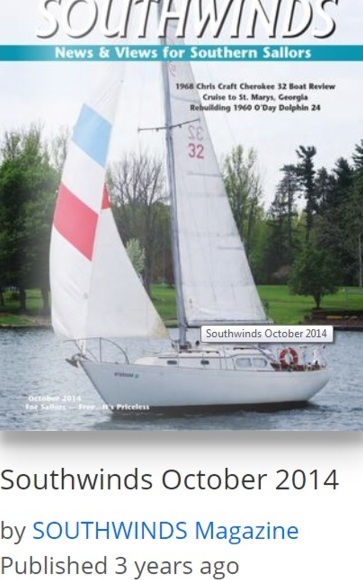 Bob sent in a copy of the article about Conch Pearl for Southwinds Magazine back in October, 2014. We set up the article on a special website page, and when we get the 'wrap article', we'll get a copy and post it there too. August 14, 2018. A voice from the past. 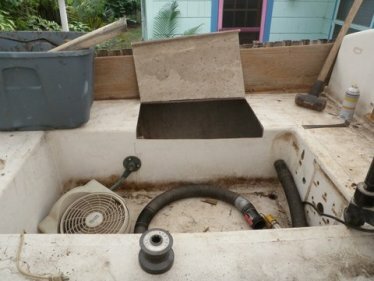 A friend of a former owner of Mele sent in the following email and pictures.